Did you know we lose fat by breathing it out? It’s true. I discovered this on my quest to losing 18 pounds (and counting) this year. The myth is we “burn” fat, or fat lost through diet and exercise breaks up and gets excreted. But scientists discovered awhile ago that’s not how it works. Instead, we store fat as triglyceride molecules, which are simply made up of carbon, hydrogen, and oxygen. To lose weight, your triglycerides must oxidize, which consumes the molecules of oxygen while producing carbon dioxide (CO2) and water (H2O) as waste products. Research shows, during weight loss, 84 percent of fat lost turns into carbon dioxide and leaves the body through the lungs, whereas the remaining 16 percent becomes water and leaves the body as water normally does (sweat and tears if you have players like mine). As game masters, we perform a similar transformation. We take all our inputs — rules, ideas, creations, perceptions — and transform them into outputs, which I call gameplay. Some of my favourite outputs includes maps, crafting encounters, running combats, making quips and jokes, and roleplaying NPCs. As with inputs, we need to focus our efforts where our greatest rewards dangle. If you love action scenes, run action games. If you love deep character stories, work with players to create and roleplay deep NPCs. If you love building dungeons, then feature them. Your outputs — gameplay — are based on your inputs. What inputs excite you most? If you choose to focus on the inputs that rob you of energy, your outputs will suffer. Can you see how that might work? Your favourite inputs are like vitamins that keep your GMing and gameplay healthy. Your inputs directly affect the quality of your output. What gameplay produces turns into new inputs for your next gameplay or planning session. It’s an amazing ecosystem of ideas, fears, stresses, and pleasures. If you choose bad inputs, you’ll get poorer outputs as a result. And those crummy outputs leave you with less exciting inputs. It’s a Vicious Mockery of a cycle. 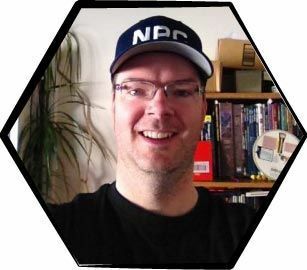 If you choose to focus on your favourite vitamins — the broccoli and spinach of your GMing (but for which you love the taste, heh) — then your game thrives and gets you better outputs, which gives you more, healthy, vitamin inputs as your campaign grows. It’s a remarkable but oft invisible ecosystem. In my experience, it all starts with your campaign premise. If the central ideas of your campaign do not harmonize with your strengths, passions, and vitamins, the campaign will be short-lived indeed. To help with this, I’m holding a one day flash sale on my Campaign Seeds book. 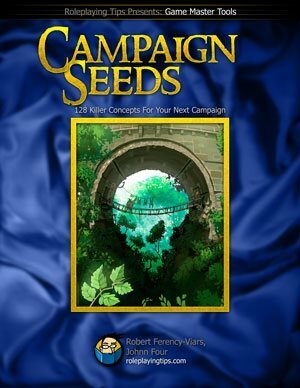 It not only contains 128 great concepts for campaigns, but within its 109 pages I teach you the four-step Campaign Seeds Formula for a lifetime of campaign generations. The more you put your thinking, creativity, time, and energy into the inputs and outputs that reward you, the more rewarding gameplay will be for you and your friends. Get rid of the fat and become a lean and healthy game master.